The guys (minus Donnie who was filming Blue Bloods), made an appearance at the Mass. Eye and Ear 6th Annual Sense-ation Gala last night. 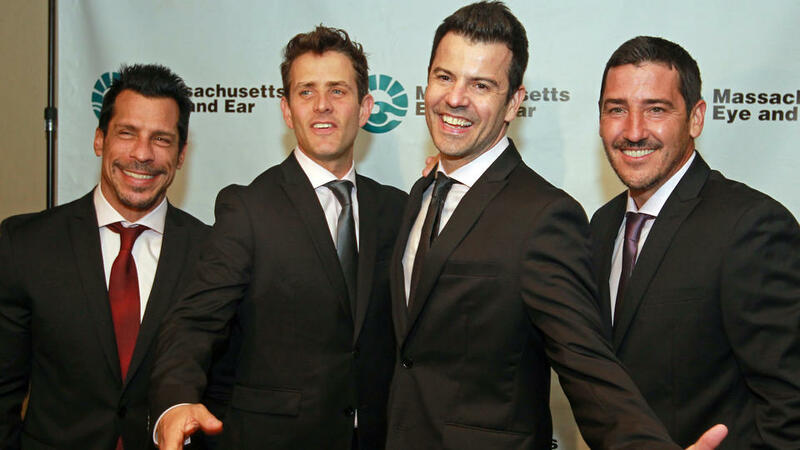 “The Right Stuff” kicked off the New Kids on the Block’s setlist at the Mass. Eye and Ear 6th Annual Sense-ation Gala last night, and the title captured the spirit of the evening. More than 600 guests celebrated the launch of “Bold Science. Life Changing Cures. The Campaign for Mass. Eye and Ear” at the Westin Copley Place. Mass. Eye and Ear announced the campaign goal of $200 million, and raised more than $100 million in the so-called “quiet phase.” Last night’s gala raked in $1.3 million. Donnie Wahlberg was absent (he was due on the “Blue Bloods” set in NYC) as Joey McIntyre and the rest of the “Kids” took the stage. VIPs in attendance included Boston Celtics owner Wyc Grousbeck, Mass. Eye and Ear president and CEO John Fernandez, chief of ophthalmology Dr. Joan Miller, Joey’s wife Barrett McIntyre, Michelle and Bob Atchinson, Drs. Sunny and Debbie Eappen, Barry Sloane, and John and Claire Bertucci. The men of New Kids on the Block have been performing for days. From Thursday to Monday, they were on a cruise with fans from Miami to Grand Turk — a voyage that was recorded for the second season of “Rock This Boat” on the Pop network. After the trip was over, the group came straight to Boston to perform at Tuesday night’s 6th Annual Sense-ation! Gala for Massachusetts Eye and Ear Infirmary. 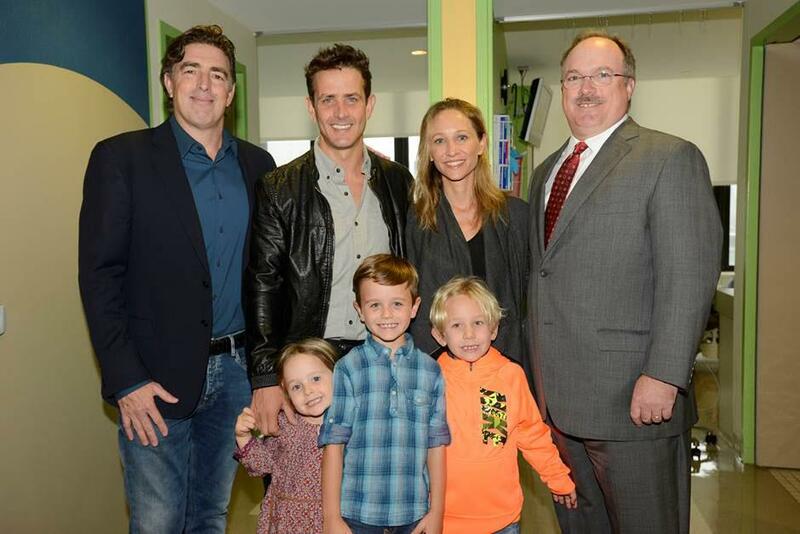 New Kid Joey McIntyre, who has served as an honorary co-chair of the gala since it launched in 2010, got involved with Mass. Eye and Ear after his son Rhys was born with severe hearing loss in 2009. He told us he was humbled that his fellow New Kids (minus Donnie Wahlberg, who had a filming conflict) were able to join him at this year’s event, and added that the hospital is a big part of the Boston community for anyone who grew up around town. “We’ve all been there as kids for one reason or another,” he said. As for “Rock This Boat,” McIntyre told us the second season will feature more of the guys, as opposed to just fans on the cruise. 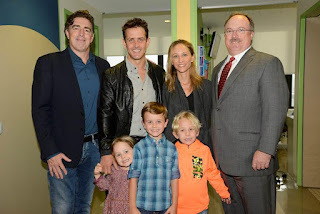 Earlier in the day, the McIntyres — Joey, wife Barrett, and their kids Kira, Griffin, and Rhys — were with Mass. Eye and Ear board chairman Wyc Grousbeck (left) and CEO John Fernandez (right) at Mass. Eye and Ear. Check out more photos on the Massachusetts Eye and Ear Infirmary's Facebook page. People who works there are some of the sweetest people I've met. Save yourself some time and just go there. Everyone at event venues Chicago is sweet and ask how you've been, even though normally staff keep their heads down.